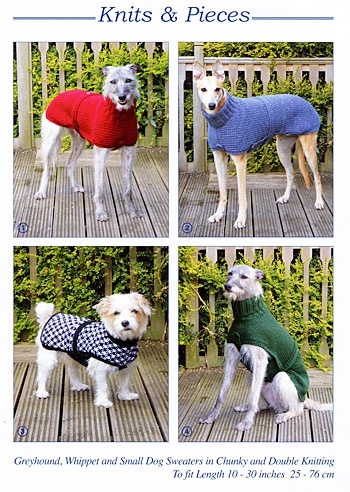 Another good value knitting pattern for our best friends. The lengths are adjustable and instructions are given to knit them in a chunky yarn in either stocking stitch or an easy rib pattern. There is also included a smart �City� coat, knitted in double knitting for our smaller friends. Instructions are for two sizes: very small Yorkshire Terrier type and a medium Jack Russell size. All designs have an underside for extra warmth, side button fastening for easy dressing and an adjustable belt.